(From company literature) The 1.4X teleconverter will increase the focal length of the master lens by 1.4X and make the lens one f-stop slower. The 2X doubles the focal length of the master lens and makes the lens two f-stops slower. 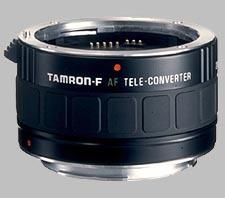 In addition to increasing focal length, both teleconverters allow greater magnification in macro since the Minimum Object Distance (MOD) of the master lens does not change when used with the teleconverters. Though using a teleconverter on wide-angle lenses is never really recommended, these converters can be used with lenses that are wider than 90mm and are ideal for all lenses that are not f/2.8 or faster. eliminate any CA, stopped down to f8-11, too. For the money this TC is great and it frequently amazes me. I use it exclusively with my Nikkor 80-200 ED F2.8 and D700 for wildlife and some action work. Its important to remember with any TC that if your object lens is not sharp your TC will not magically make it better...it simply multiplies what you give it. For example the 80-200 2.8 is somewhat soft at 200mm irrespective of the aperture , whereas is extremely sharp at 80-135. So put the tamron on set the zoom to 105 and hey presto its real sharp at 200mm equivalent....albeit 2 stops slower. Have a look at the shot below: this was taken with the TC on and is a 50% crop from the original photo. By comparison I have used the Nikkor 300mm F4 with a 1.4 Nikkor TC in similar situations and its focus performance overall is inferior. Its annoying it doesn't report the actual aperture as that screws up the EXIF. the only other issue is some CA but its not really bad.